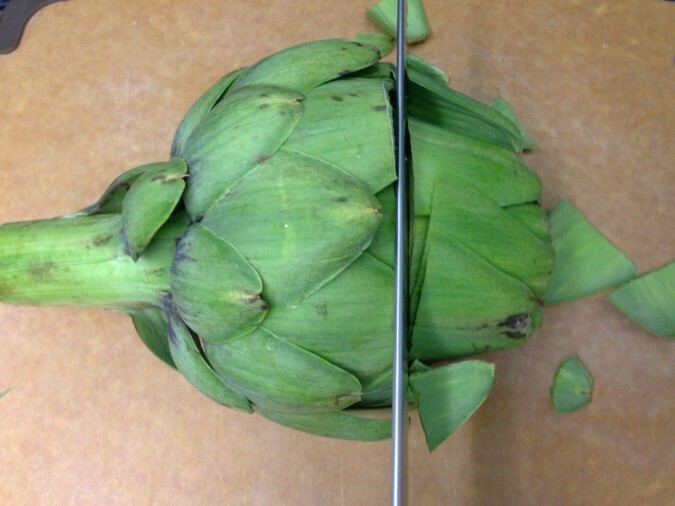 1) Take the artichoke and bend back one of the outer leaves, the leaf should “snap” showing the artichoke is fresh. If the leaf bends back then it is way past its prime. Also, the leaves should generally be tight together, if the leaves are spread out as if the flower were about to bloom then it is also past its prime. 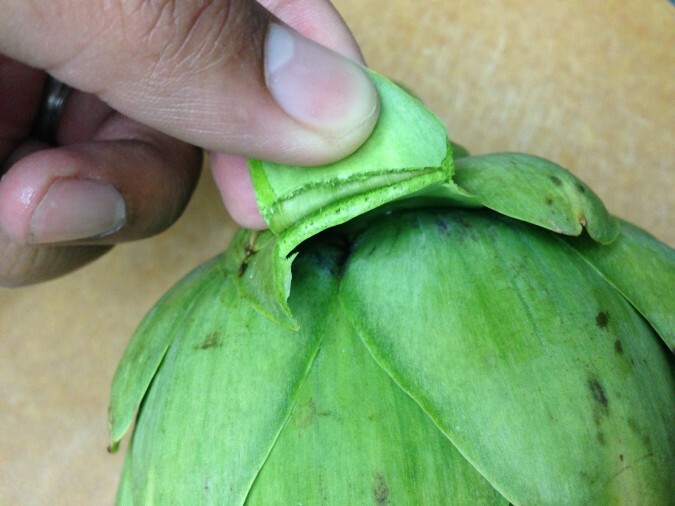 If you look at the first picture a ripe artichoke should look like that where the inner leaves are so tight together they form a shell at the top. The outer leaves can be opening up a little, but you don’t want the entire artichoke to be spread out. 2) Look at the stem of the artichoke, find the thickest stem possible. 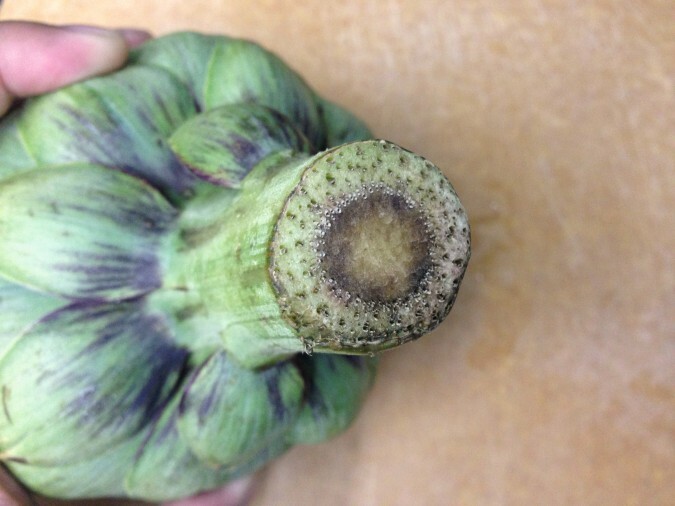 A thicker stem means the plant was more mature when it was harvested and therefore you are going to get more “meat” in the artichoke heart. 3) Look at the bottom of the steam, you want to see a stem that is still green. If your steam is still somewhat green that means the artichoke is relatively fresh and therefore it is good to eat. If the bottom of the steam looks dried out and brown, or even black that means it is well paste its prime and not worth buying. Now all three signs are important to look at, you cannot just look at one and ignore the other two. Eating artichoke is a super simple dish and simple dishes require quality ingredients so 80% of your success in enjoying a good artichoke is starting with a quality artichoke. Now that you know how to select an artichoke we need to know how to prepare it. Start off by holding the artichoke horizontally. 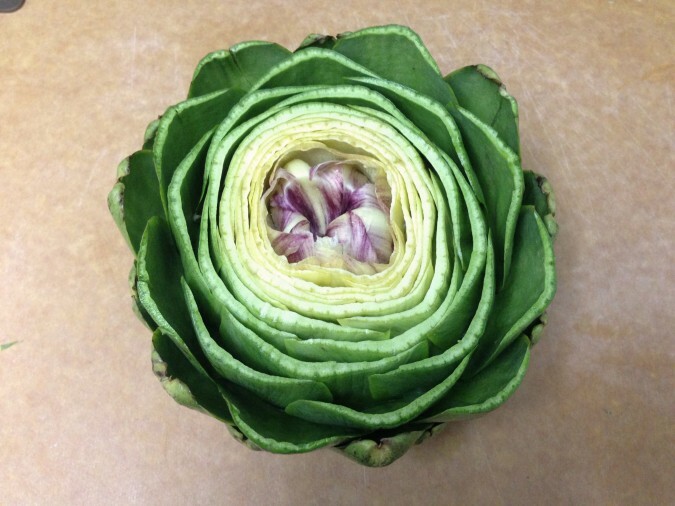 Hold the artichoke by the stem and cut to top 1-2″ of artichoke leaves off. Since artichoke leaves have thorns on their tips you want to cut the artichoke far enough down to the thorns are removed which will make it easier to eat. Use a sharp chefs knife or a serrated bread knife to cut through the artichoke. Next you want to cut off the stem so the artichoke can sit flat. 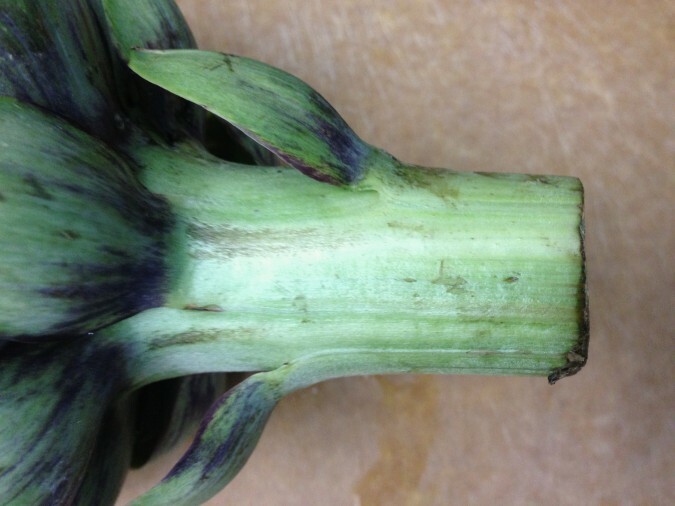 Don’t cut too much of the stem off because part of the stem is the artichoke heart, I usually leave about 1/4″ of the stem. Once your artichoke is prepped you should rinse it under the sink. I usually use a large metal bowl and I fill it with water. I run the artichoke under running water for a while then I take the whole thing and submerge it under water in the metal bowl. This will help remove any dirt that may be caught in the leaves. Artichokes are pretty tough so feel free to give the artichoke a squeeze so water can get in between each leaf. In a large steamer bring your water to a boil with the lid on so you can build up a head of steam. 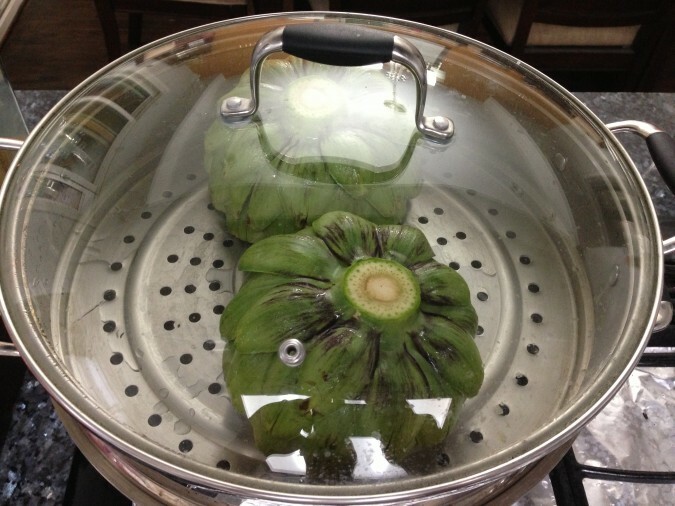 Open the lid and place your artichoke face down in the steamer then immediately cover and steam for roughly 10 – 13 minutes depending on the size of your artichoke. For large ones 13 minutes and smaller ones 10 minutes. Once your artichokes are done cooking you will want to use a peering knife to test the artichoke to make sure it is ready to eat. 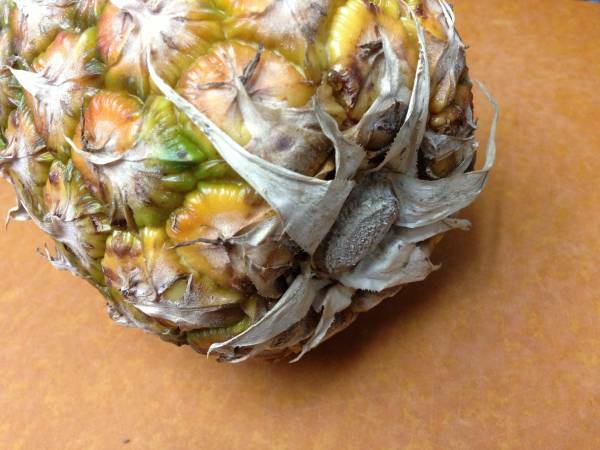 Poke your knife into the bottom of the artichoke where the stem use to be. 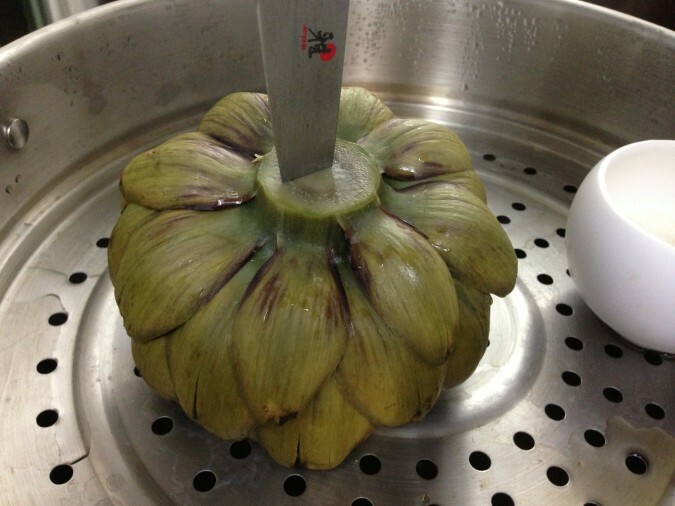 If the artichoke is cooked the knife should easily slide in with very little force and it should slide right out when you pull the blade back. If the knife doesn’t easily slide in or if the blade doesn’t easily come out then your artichoke needs to cook a few minutes longer. For the melted butter I usually add the butter into a small serving dish and place it into the steamer during the last 5 minutes of the cooking processes, that way the butter is melted by the time the artichoke is done cooking. Now all you have to do is enjoy eating your artichoke! 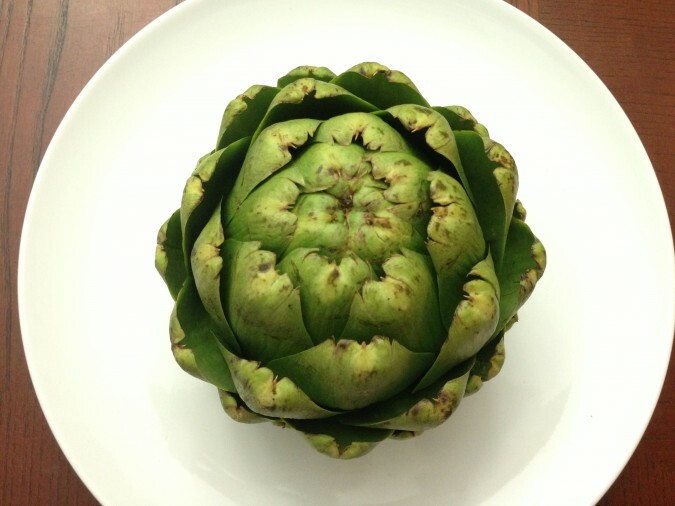 If you’ve never eaten an artichoke before it is very simple. I like to flip my artichoke upside down so I can easily peel the leaves off. The outer layer of the artichoke isn’t going to have much edible “meat”, so I usually pull off the first 2-3 layers of leaves. What you are looking for is the light green, almost white artichoke “meat” that is found at the base of the leaf, the texture of this meat is like the stem of a cooked broccoli. What you want to do is use your two front upper teeth to scrape that meat off the leaf. I like to dip my artichoke in a little butter but I recommend trying it with and without butter. One cool fact about artichoke if you drink water after eating an artichoke the water will taste sweet. 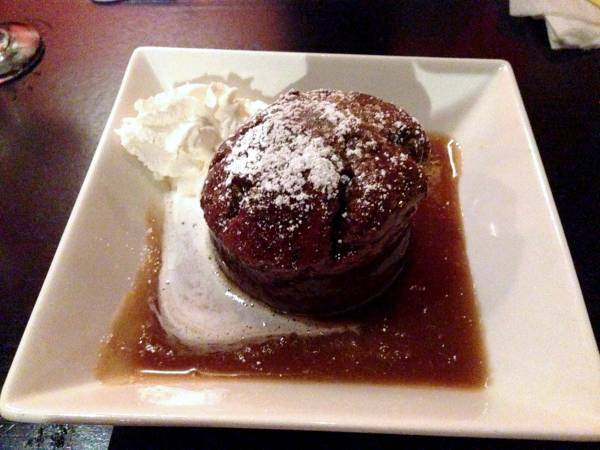 Artichoke tends to make everything taste a little sweeter after you eat an artichoke. 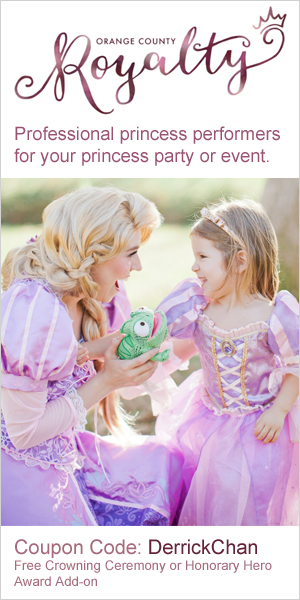 I hope this post has been helpful, please leave comments or like/share this on Facebook if you found it helpful. 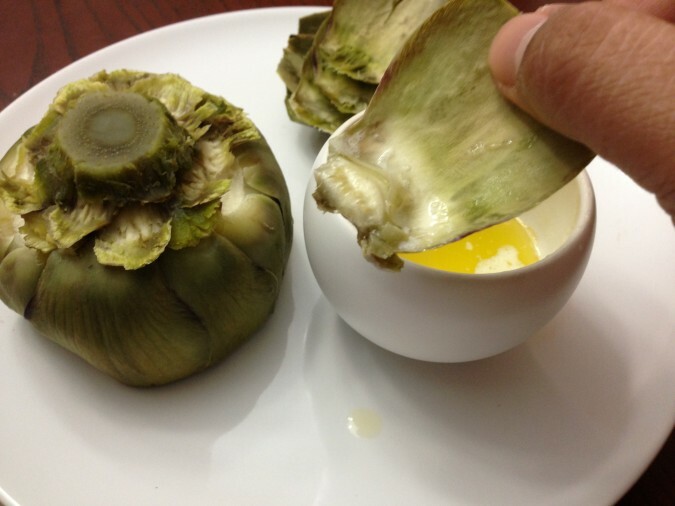 I completely forgot to take pictures of the last process in eating an artichoke which is how to deal with the “fur” in the middle and how to access the artichoke “heart”. Sorry, when I am in the middle of eating an artichoke I tend to forget about blogging… Next time I will take pictures and add to this post so you can see the full process of eating an artichoke. 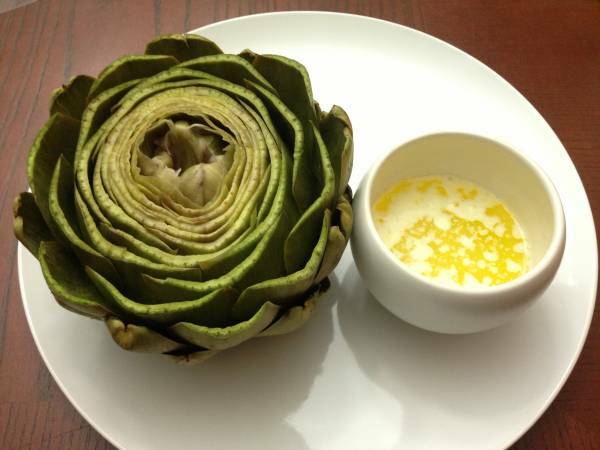 Reach a full article on how to pick and prepare a simple steamed artichoke dish.